Preheat oven to 400°. Oil two large baking sheets. 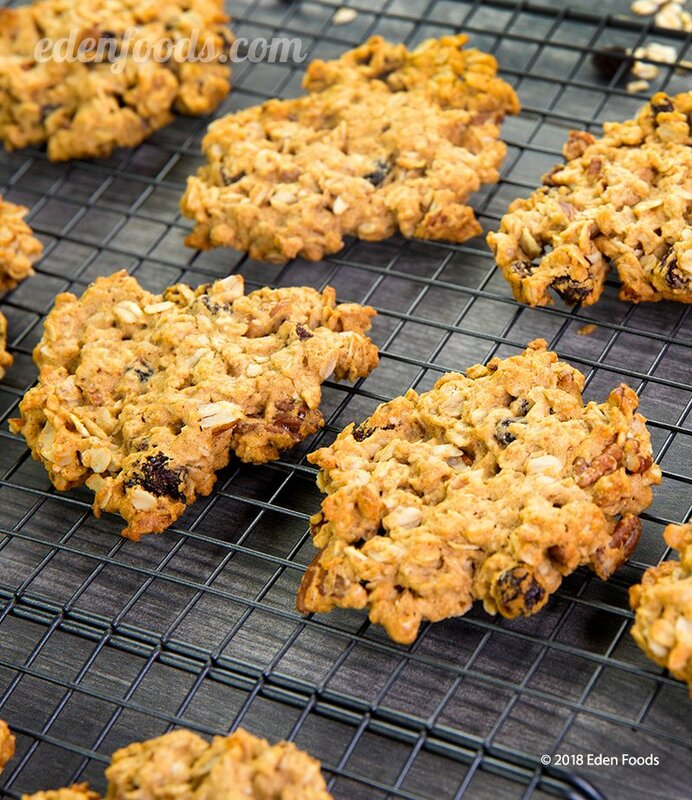 In a large bowl, mix together oats, flours, baking powder, salt, cinnamon, raisins and nuts. In another bowl or blender combine remaining liquid ingredients. Mix together the wet and dry ingredients. Lightly oil two baking sheets. Drop batter by heaping tablespoons, about two inches apart, on to the baking sheets. Press each cookie with moisten fingers or a spoon to flatten. Bake 17 to 20 minutes or until golden brown on the bottom. Transfer cookies to a rack to cool. Delicious with a cool glass of Edensoy Vanilla!